Complies with EMC Emission Standard EN 55015. 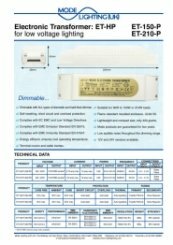 Complies with EMC Immunity Standard EN 61547. Energy efficient, ensures cool operating temperature. Terminal covers and cable clamps. Suitable for 50W to 150W or 210W loads. Flame retardant moulded enclosure, UL94-V0. Lightweight and compact size, only 400 grams. Mode products are guaranteed for two years.